..::Welcome to AJ Nay.com:. 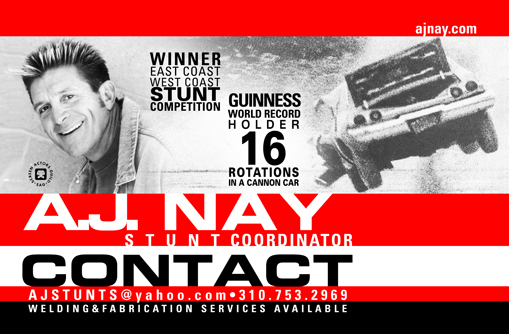 : Actor, Stuntman and Stunt Coordinator::..
A.J. began very early in life pursuing his love for action and speed. At age 5 his dad put him on a pair of water skis and he soon became a very proficient skier, graduating almost immediately to a single ski. The harder A.J. could cut, the higher he could wake jump and the faster he could go the better. This presentation will show you A.J. 's current ski boat. A.J. 's dad “Tee” an avid hot-rodder decided it was time to take a shot at some action on the pavement. He built a go-kart, and the racing as well as precision driving skills began…about age 9 or 10. This progression continued through the years as A.J. grew into many racing venues that included professional racing licenses in the A.M.A. (American Motorcycle Association) dirt track, road racing, class “A” speedway and finally NASCAR late model stock cars. A.J. also excelled in collegiate sports such as baseball, wrestling, and track. These combined skills made moving into stunt work a smooth and natural transition. A.J. entered Paul Staders Stunt College in Santa Monica and instantly became a star performer. He also wanted to hone some acting skills and began studying. Acting coaches include Charles Conrad, Milton Katseles, and Bobbi Morris commercial study. You are looking at a talented stunt coordinator who knows how to get it done, make it look real and at the same time explosive. Now the final and most important ingredient, as his impeccable record shows, keep it safe. A.J. can coordinate the stunt, perform the stunt, and act on stage or film. You are reviewing a solid package, thank you and enjoy the reel.